A player can use this and target any player that has already died. That player returns to the game with one health and two cards. When a player is resurrected they keep the same general and role that they had before in the game. No matter how much damage they took when they died, they are restored to one health. When they return, they are in their default starting positions, they are not in Chains nor are the flipped, even if they died that way. They lost all their equipment and cards when they died, so the two they draw will be the only cards they have. They also will not have any pending judgment cards on them since these would be lost when they died. If the character uses any tokens of any sort these are all discarded when they die. This means that they are starting over from scratch when they are revived. Singe use abilities retain the status that they had before. If they used it already, they cannot use it again. If they have not done it yet, they can do it when applicable now. Beginning of game abilities, such as God Zhuge Liang or Zuo Ci, do not go into effect when they are revived. They are rejoining the game already in progress. This means that God Zhuge would be without his Stars, and Zuo Ci would restart without any forms. When someone comes back they are still considered 'dead' for the winning requirements of either side. This means that if a rebel is brought back, the king does not need to re-kill them. It might make their life easier, but if they kill all the other rebels and spy with the revived one still around, the game ends because all the rebels and spy were killed. The same works for the spy or loyalist. To symbolize that someone is on their revived life, their role card is to remain face up as they play. Since they were already killed, there is no reward for re-killing a rebel. 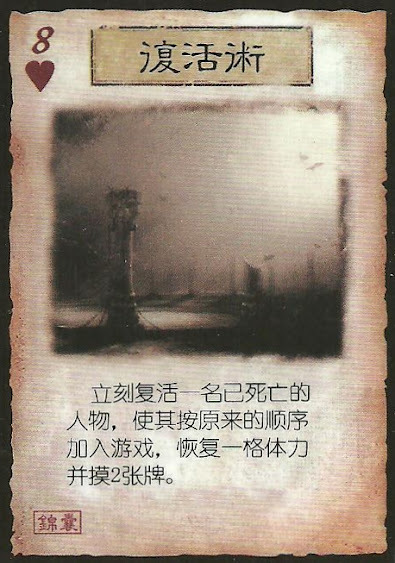 A player could be revived more than once, as long as they were dead each time this card was played.